A cervical herniated disc is when the inside core of the disc leaks out of the disc and presses on an adjacent nerve root. A cervical herniated disc may occur due to trauma or be spontaneous. Something as simple as a sneeze can herniate a disc. Because there is not a lot of space available in the cervical spinal canal, even a small cervical disc herniation can press on one of the nerves and cause significant pain. Though neck pain is usually present, the most common pain is in the trapezius, arm and hand of the affected side. This will generally follow the normal distribution of the nerve affected. Some numbness and tingling may also be reported. This is called cervical radiculopathy. If the disc is herniated back onto the spinal cord, the patient may not feel any pain at all. Their symptoms can be numbness and weakness in all extremities, clumsiness, or loss of balance. This is called cervical myelopathy. Most herniated discs tend to shrink back into the disc space or dissolve over time. Conservative care is recommended first, unless the patient has signs of paralysis. 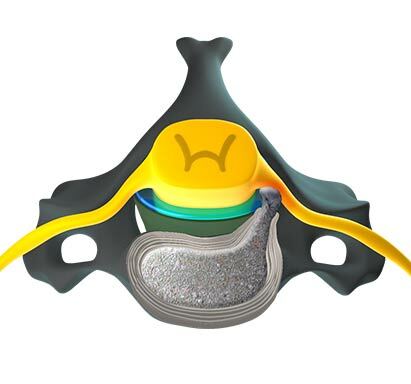 Once the disc has been herniated, disc degeneration will often be accelerated due to the loss of fluid in the disc space.